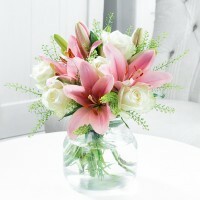 A classic bouquet of pink LA lilies and pure white athena rose. This arrangement is perfect for any occasion, be it birthday or new born, and is sure to leave the recipient more than impressed by their floral surprise. The bouquet will be delivered hand-tied along with your personal message.